Chamoli is a beautiful town nestled in the Garhwal Himalayas of Uttarakhand. It is perched at an elevation of 1300 metres above sea level and is bedecked on the holy banks of river Alaknanda. The city offers a promising view of nature, woods, the rumbling creeks and the alpine hills. Although every place in Uttarakhand is scenic, but Chamoli is one such place where you can find eye captivating natural beauty, along with spirituality and peace. The people of Chamoli are attached to their roots so you can have a glimpse of their culture in their day to day life. The city showcases its rich history and is also rich in varied flora-fauna. It is one of the few places where you can spend a leisure weekend in the midst of the Himalayas. Linked with NH-58, Chamoli is a perfect halt for the travellers as one can easily locate some of the budget friendly hotels and guest houses here. The precinct of Chamoli city adds five stars to its name as the famous tourist destinations of the Garhwal region such as the Badrinath temple, Auli, Hemkund Sahib, Valley of flowers, Gopinath temple, Tungnath, Chopta, Ukhimath etc are located nearby. Also, the night view of Gopeshwar city from Chamoli is a sight to behold. Nature Walks: The natural beauty that envelops the vicinity of Chamoli is quite mesmerizing. 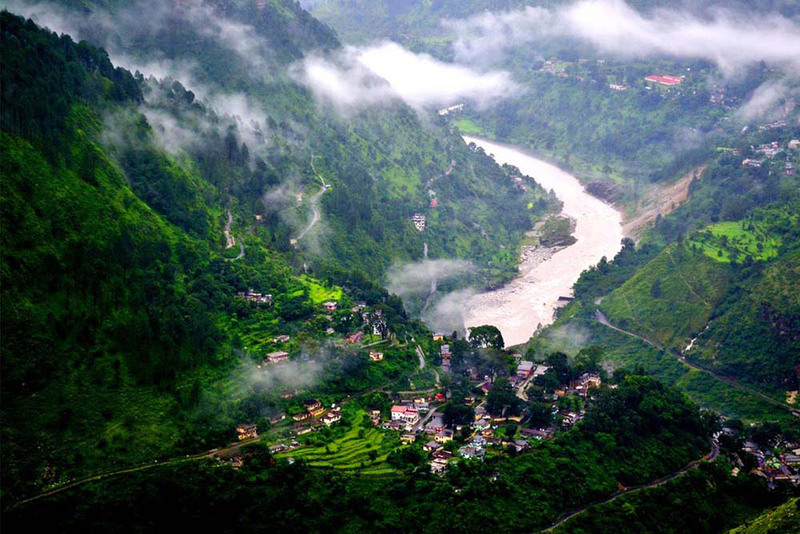 The namesake district is one of the most gorgeous regions of Uttarakhand. The possibility of exploring this beautiful area would be hard to resist. One can easily hike to the nearby villages in and around Chamoli. Village Tourism – The natural trails in and around Chamoli takes one through the perched Garhwali hamlets. One can explore the rustic life in a village and learn about their way of life, customs and festivals. Shopping: Being a commercial town, Chamoli does have lot of shops and stores where one can purchase handlooms, artifacts, indigenous household items, pickles, jams etc. Apparels made from Angora wool can also be purchased at Chamoli. Chamoli is a small township in the Garhwal hills and is situated enroute to Joshimath-Badrinath Highway. There are quite a few budget accommodations available at Chamoli where tourists can stay. During the Char Dham Yatra peak season, when finding an accommodation is quite difficult in Badrinath and Joshimath, pilgrims tend to stay at Chamoli and make a day—trip to Badrinath. Chamoli may not offer variety of cuisines as chances of finding a decent restaurant that serves different platters is slim. Local food joints and roadside eateries specialize in popular North Indian and Chinese dishes. Local cuisine is worth giving a try one can taste all sorts of Pahadi dishes like Chainsoo, Gahat Dal, Sisunak Saag, Kappa to name a few. However, In-house restaurants of the expensive hotels serve all types of cuisine. The history of Chamoli dates back to the 6th century A.D. Initially, it was under the rule of King Bhanu Pratap of Panwar dynasty of Garhwal, who founded Chandpur-Garhi as the capital. Later in September 1803, an earthquake hit the region and weakened the economic as well as administrative set up of the Garhwal dynasty. The Gorkhas took advantage of the situation and attacked the kingdom, taking control over half of the Garhwal kingdom, till 1804. The region remained under the rule of the Gorkhas until 1815 when the British Government came and took it under its rule. In 1997 Chamoli city became a part of a separate, Chamoli district carved out of Pauri Garhwal. Chamoli experiences salubrious weather throughout the year, therefore it is an ideal place for the travellers to chill, relax and enrapture in adventure activities. One can visit here anytime but if you are looking for some refreshing natural views to replenish your soul then, it is advised to plan a trip between June to September as nature is in full bloom. Chamoli is only 2-3 hours drive away and features some of the best excursion places of Uttarakhand like the sacred Badrinath, the pious Hemkund Sahib, the blossoming Valley of Flowers, Auli known as the ‘Switzerland of India’, Gopeshwar, Chopta, Tungnath and many more. So if you are a wanderer then Chamoli is the place for you. It is noted for its several shrines and temples and is the birth place of the renowned Chipko movement which led the focus of the whole world towards our nature and the atrocities done to it by us. Chamoli is known for its villages and the rich culture of the Garhwal region. What is Chamoli famous for? Chamoli is famous among tourist as Local Market, Enroute Badrinath. Chamoli is popular destination for following activities/ interests - Business Hub, Char Dham Route, Others. Travelling to Chamoli in 2019? Contact us for planning your Chamoli tour with best travel packages of as per your requirements!